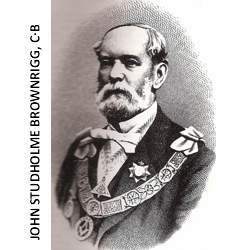 To write a history about the Albert Edward Lodge 1714 Province of Surrey from its consecration in 1877 to 1977 at first sight seems a simple matter of relating facts about people and events gleaned from the minute books so carefully kept for a period of lOO years. It is also usual when telling a story to start at the beginning, but in this case we felt that the reader, primarily interested in the English Constitution of Freemasons, would also be interested in a slight historical reference to Cambridge Town and New Town, with their Royal and Military connections. In the early 19th Century the War Office purchased 325 acres of land near Blackwater, suitable for the establishment of a military college; H.R.H. Frederick Duke of York, Commander in Chief of the British Army signed the draft of a royal warrant establishing The Royal Military College. Cadets were first received’ into a school at High Wycombe and later transferred to premises at Great Marlow, In 1812 the college at Sandhurst was opened and its original purpose of free education of orphan sons of military officers who had died in the service, was altered and from 1870 the training which previously had been chiefly civil became strictly military. TThe foundation stone of the Staff College was laid by the Duke of Cambridge in December 1859; it was opened in the autumn of 1862. Queen Victoria and Prince Albert took the greatest interest in the building of the Staff College, but Prince Albert died in December 1861. In 1864 the Royal Albert Orphanage was established in the district in his memory. Many shops, etc., were established opposite the colleges gates, many of them owned by Marlow and Wycombe traders, who had followed the college, to maintain continuity of trade. The new community was given the name of New Town, which in 1831 was changed to York Town, commemorated locally by the Duke of York Hotel.